Dana Ghazle passed her Beirut Bar Association entry exam in 2017, and joined the firm in the same year. Dana is involved in various cases pertaining to several areas of Law such as civil law, corporate, commercial, and criminal law. Dana also takes interest in the branches of International Law related to International Criminal Law, International Humanitarian Law, International Human Rights Law. 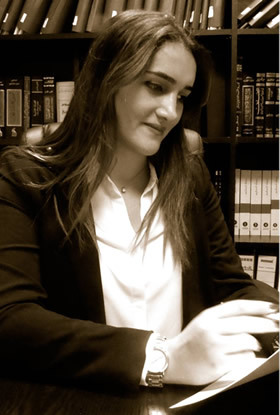 Accordingly, Dana has attended several significant workshops and participated in the intensive courses on International Criminal Law of the Inter-University Program organized by the Special Tribunal For Lebanon and The Asser Instituut, and was chosen amongst the top students to visit the prominent International Courts in the Hague, Netherlands. Dana graduated from La Sagesse University with a Bachelor of Lebanese Law, and a Bachelor of Political Science and International Relations. Prior to joining the firm, Dana worked in another Lebanese Law Firm. Dana is fluent in Arabic, and English; and has an intermediate knowledge of French.